The 'Homo antecessor', a hominin species that inhabited the Iberian Peninsula around 800,000 years ago, would have a mechanically more demanding diet than other hominin species in Europe and the African continent. This unique pattern, which would be characterized by the consumption of hard and abrasive foods, may be explained by the differences in food processing in a very demanding environment with fluctuations in climate and food resources, according to a study published in the journal Scientific Reports and led by a team from the University of Alicante, the Faculty of Biology of the University of Barcelona and the Catalan Institute of Human Paleoecology and Social Evolution (IPHES). 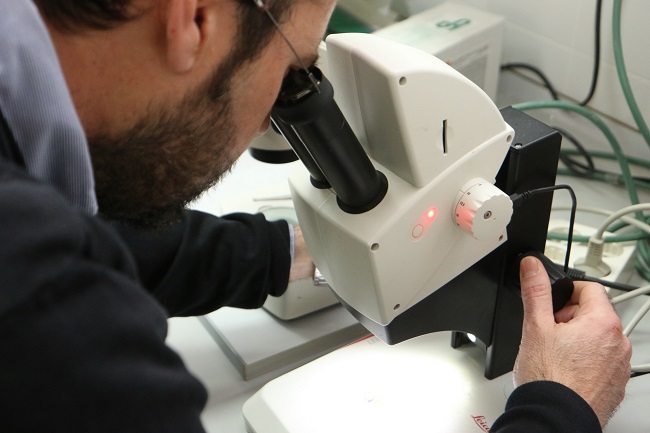 This new research, which reveals for the first time the evidence on the diet of these hominines with the study of the microscopic traces left by food in the dental enamel, relies on the participation of the researchers Alejandro Pérez-Pérez and his team, formed by the doctors Laura Martínez, Ferrán Estebaranz, and Beatriz Pinilla (UB), Marina Lozano (Catalan Institute of Human Paleoecology and Social Evolution, IPHES), Alejandro Romero (University of Alicante), Jordi Galbany (George Washington University, United States) and the co-directors of Atapuerca, José María Bermúdez de Castro (National Research Centre on Human Evolution, CENIEH), Eudald Carbonell (IPHES) and Juan Luís Arsuaga (Universidad Complutense de Madrid). Before this research, the diet of the hominines of the Lower Pleistocene of Atapuerca (Burgos, Spain), our most remote European ancestors, had been inferred from animal remains –a great variety of large mammals and even turtles– found in the same levels in which the human remains were found. Evidence of cannibalism has also been suggested in some of these fossils. Evidence of cannibalism has also been suggested in some of these fossils. The study is based on the analysis of the buccal microwear pattern of the fossils from Trinchera Elefante and Gran Dolina in the Atapuerca site. 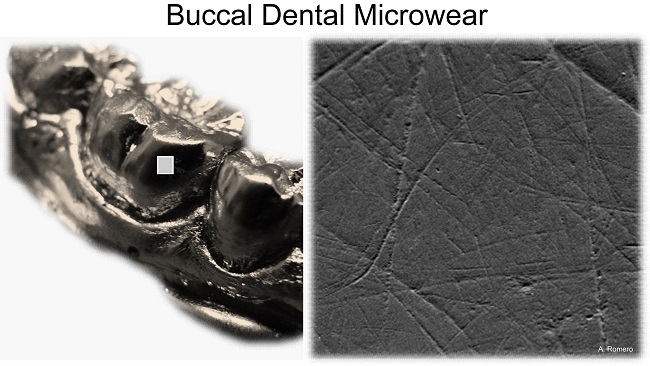 The examined microwear features are small marks on the buccal teeth enamel surface , whose density and length depend on the types of chewed food. 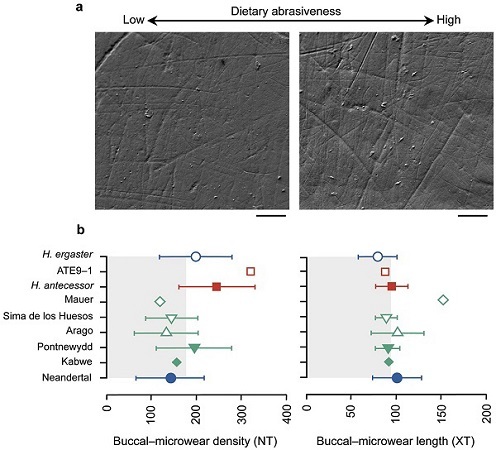 "The usefulness of this methodology has been proved by the study of the microwear patterns of present populations, both hunter-gatherer and agricultural, showing that different feeding patterns correlate with specific microwear patterns in the vestibular surface of the dental crown", explains Professor Alejandro Pérez-Pérez, professor at the Zoology and Biological Anthropology Unit of theof the Department of Evolutionary Biology, Ecology and Environmental Sciences at the University of Barcelona. 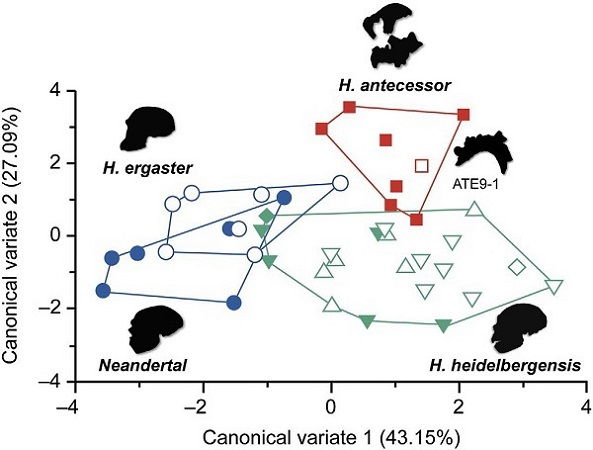 In the new study, the Atapuerca fossils have been compared with samples from other Lower Pleistocene populations: with fossils of the African Homo ergaster, ancestors of all Europeans dated from 1.8 million years ago; and also with Homo heidelbergensis, which appeared more than 500,000 years ago in Europe and lasted until at least 200,000 years ago, and finally with Homo neanderthalensis specimens from the Iberian Peninsula that lived between 200,000 and 40,000 years ago. The results of the study show that the teeth of H. antecessor show higher striation densities than the rest of the analyzed species. "Our findings do not allow us to say exactly what foods they ate, since the abrasive materials that cause the marks on the teeth may have different origins, but they do allow us to point out that H. antecessor would have had a diet largely based on hard and abrasive foods, such as plants containing phytoliths (which are silica particles produced by plants that are as hard as enamel), tubers with traces of soil particles, collagen or connective tissue and bone or raw meat”, researcher said. The researchers suggest that differences in the Gran Dolina microwear patterns among the compared samples could reflect cultural differences in the way food was processed. "Hunting and gathering activities are consistent with the highly-abrasive wear pattern we have encountered, but it is very difficult to think that the available food in the Atapuerca area was very different from that available to other hunter-gatherer hominins. Therefore, it would be the different ways of processing the food that would give rise to these differences in the dental microwear patterns. That is to say, they processed and consumed the food in different ways", Alejandro Pérez-Pérez explained, who leads a team that has also applied this methodology in the study of feeding behaviours of the hominins of the East Africa Pleistocene, including the Paranthropus boisei and Homo habilis species. This pattern of great abrasiveness, observed on the enamel teeth surfaces in Gran Dolina contrasts with what has been observed in the compared species in the study. "Unlike H. neanderthalensis, which had a more advanced lithic industry (called Mode 3 or Mousterian), the tools that have been found related to 'Homo antecessor' are primitive (Mode 1). These industries would not facilitate food processing, as also suggested by evidence that they used teeth to chew bones. Also, the lack of evidence of the use of fire in Atapuerca suggests that they would surely eat everything raw, causing more dental waste, including plant foods, meat, tendons or skin. For the researchers, a diet with a high meat consumption could have evolutionary implications. "Meat in the diet could have contributed to gain the necessary energy to sustain a large brain like that of H. antecessor, with a volume of approximately 1,000 cubic centimeters, compared to the 764 of the H. ergaster, but it would also represent a significant source of food in a highly demanding environment where preferred foods, such as ripe fruits and tender vegetables, would vary seasonally", as the researcher added. A. Pérez-Pérez, M. Lozano, A. Romero, L. M. Martínez, J. Galbany, B. Pinilla, F. Estebaranz-Sánchez, J. M. Bermúdez de Castro, E. Carbonell and J. L. Arsuaga. «The diet of the first Europeans from Atapuerca». Scientific Reports, February 2017.